Suffering from acid reflux and heartburn? Also known as gastroesophageal reflux (GERD) or peptic ulcer, acid reflux is a very common health problem, affecting 25 million Americans each year according to the National Institute of Health. It is often erroneously assumed that acid reflux is caused by excessive acid production in our stomach, resulting in acid-blocking drugs such as proton pump inhibitors being typically prescribed. However, acid reflux is actually caused by the malfunctioning of the lower esophageal sphincter (LES) which allows acid from the stomach to flow backward into our esophagus, triggering "heartburn", a painful burning sensation behind the breastbone. Most common reasons for the malfunctioning of the LES include Hiatal hernia, Helicobacter pylori (H. pylori) infection, and low production of hydrochloric acid (stomach acid). Hence, using drugs to "block" stomach acid production in the long run when there is in fact a lack of stomach acid can have disastrous health consequences. Honey and Vinegar Remedy, an extremely popular page of Benefits of Honey since 2009 has led to many to share about their success stories with the concoction. And particularly, finding relief and healing for acid reflux and heartburn by taking cider vinegar and honey has been a testimony that we frequently receive. While it may seem irrational and counterintuitive for someone who is suffering from heartburn to eat such a highly acidic food, many swear by honey and apple cider vinegar's effectiveness and hail it as one of the best natural remedies for acid reflux. There are various theories to why the concoction works. Some believe that it helps balance the acid-alkaline (or acid-base) PH ratio in the body and fight any bacterial infection in the stomach. Some experts explain that in cases where there is an inadequate production of stomach acid (as explained in the earlier paragraph), taking one tablespoon of raw unfiltered apple cider vinegar in a glass of water helps to supplement the stomach acid content. D.C. Jarvis, M.D. in his famous book Folk Medicine: A Vermont Doctor's Guide to Good Health, recommended apple cider vinegar as a powerful alternative medicine for destroying harmful bacteria in the digestive tract acid reflux and advised that mixing apple cider vinegar with honey would enhance the healing power of the vinegar. 1. All apple cider vinegar and honey remedies in: Vinegar and Honey Remedy. 2. Choose the right cider vinegar for best health benefits: Is Apple Cider the Same as Apple Juice? 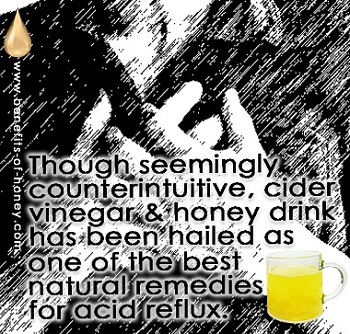 End of "Acid Reflux Remedy with Honey Cider Vinegar Drink" Back to "Alternative Medicine: What Your Doctors Don't Know".